Oh, Christian friends, pray for the people in Congo. 250,000 displaced people, 500,000 in desperate need of food, water or shelter. 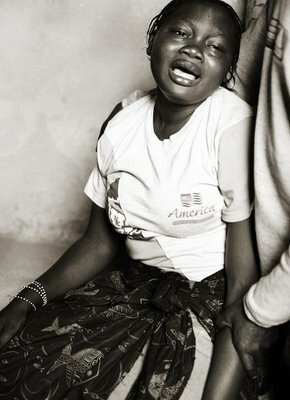 Cholera outbreak, senseless violence! For a photojournalist perspective go here and for a weblog and pics click here. I wonder as I read and see what is happening in this country in Africa: will we ever learn from the past? Such meaningless suffering and tragic loss. Here are some questions that really get to my heart. My heart is the center of my spiritual allegiances, imaginations, desires and motives, thoughts and feelings, and actions. I am reminded by this list that the heart of the matter is the matter of the heart! Have you had a week of thanksgiving? I hope this brief series has helped cultivate gratitude in your heart! As was mentioned on Sunday evening, sometimes it it difficult to give thanks for some things. But God’s Word says,”Give thanks in all circumstances; for this is the will of God in Christ Jesus for you” (1 Thessalonians 5:18). It is challenging to give thanks for some circumstances or some people. Are there past or present circumstances, events, trials, or relationships for which you have never given God thanks? Write them down. Then, as an expression of faith and obedience, say, “Lord, I choose to give You thanks for _______________________, which you may never give me the privilege of understanding.” Acknowledge God as the loving, wise, and just Sovereign over your life. Trust Him and give thanks in all circumstances. Well, I hope that these entries have encouraged you to cultivate thanksgiving. Aim to develop the lifelong habit of cultivating and attitude of gratitude. Doing so will transform your life and conform you into the image of Christ more and more. Paul describes the Spirit-controlled Christian as one who is “giving thanks always and for everything to God the Father in the name of our Lord Jesus Christ” (Ephesians 5:20). As you go through this day, try to consciously thank God for all things. . .small and big things! If you have today off to shop, relax or spend more time with family, you already have something to be thankful for! I hope you all had a wonderful thanksgiving! Remember the list you made yesterday of all kinds of people who have influenced your life for Christ? OK! To cultivate thanksgiving today, call, write, or email three people on that list and express your thanksgiving for their influence and input in your life. Didn’t write the list? OK! Make it today and express your appreciation to them.